Command-and-control management. Worn out ways of communicating. Rigid work environments. It would be hard to find anyone to advocate for this kind of workplace, or to argue its advantages in our ultra-competitive global markets. The cost is too steep. Lack of organizational agility prevents companies from adapting to new threats, and disengaged workers cost the U.S. economy up to $600 billion a year in lost productivity. We know what doesn’t work, but have we clearly defined what does? As Slack continues to emerge as the collaboration hub for companies of all shapes, sizes, and industries, we’re striving to better understand not only how people work together, but how they want to work together. The Slack Future of Work Study set out to find answers to these questions and more. Conducted by Kelton Global among more than 1,400 knowledge workers across the U.S., 500 of whom are also Slack users, the survey confirmed workers are looking for a deeper partnership with company decision makers, seek stronger bonds with colleagues, and share a clear desire for better ways to collaborate. Trust and Transparency: 80% of workers want to know more about how decisions are made in their organization and 87% want their future company to be transparent. 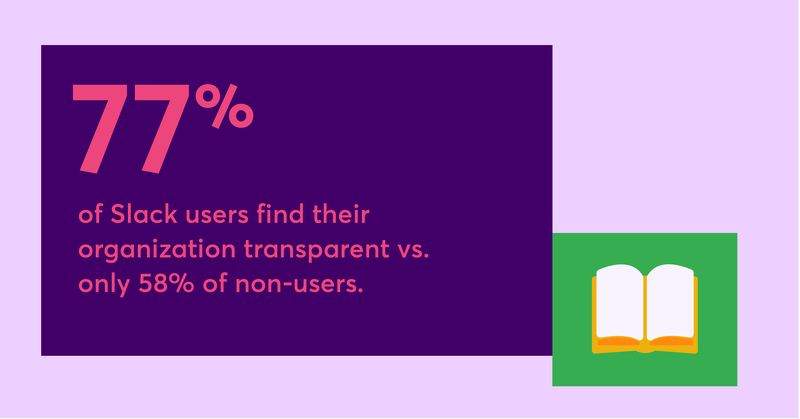 When asked about the current state of transparency in their organization, 77% of Slack users describe their organization as transparent while 55% of non-Slack users answer the same way. Companies looking to attract top talent must understand that workers today want workplaces and tools that enable an open culture of communication and collaboration. Modern Communication Tools: Only 31% of workers are “extremely satisfied” with their current work communication tools while 76% hope to have more communication tools available to them in the future. Separately, 70% of workers say the availability of Slack would be a factor when evaluating a job offer, ranking this even higher than a fitness stipend (62%), catered lunches (59%) and weekly happy hours (57%). About three-fourths of workers, or 74%, prefer the ability to send real-time messages at work when asked about the range of communication tools available to them, from email to in-person conversations. We’re not alone in this exploration. Research by McKinsey, a top U.S. consulting firm, shows that publicly traded companies with strong organizational health — which they define as the ability to rally around a common vision, execute effectively, and create a culture of innovation — deliver roughly three times better returns to shareholders. We probed into worker perspectives on these core organizational health metrics, asking if workers felt their organization communicates successfully, what they need to more fully engage with their employers, and how they gain satisfaction through their jobs and work cultures. We also sought insights into how using Slack supports a working environment that’s simpler, more pleasant, and more productive. Knowledge workers are strong advocates for transparency. Why? For some, it’s about the ability to understand and align with strategic priorities. For others, transparency helps them grow professionally, whether that’s through access to wider industry trends or learning about opportunities to take on projects outside of their normal role. What’s more, we need to start thinking of transparency beyond how it’s used in the typical business context. It’s not about managers and leaders simply being more forthcoming with information. It’s about whether people within an organization can actually see what’s going on in different departments and working groups, something that is foundational to how Slack operates. Effective leaders support transparency because it helps people move quickly and feel engaged; to operate in alignment and have the autonomy to make decisions. It’s easy to think “connection” is a soft metric, but experts say it can be one of the most critical markers of employee engagement. Strong connections at work improve individual happiness, but also effectiveness on the job, according to organizational psychologist and bestselling author Adam Grant, who writes frequently about the impact of relationships in the workplace. To learn more about how colleagues stay connected, we probed into the level of satisfaction with communication at work. Nearly one in four workers, 24%, say they are dissatisfied with communication at work, including how information is shared. Further, nearly three-fourths of workers, 74%, believe the workplaces of the future will be more collaborative. They also expect their colleagues to be more geographically dispersed (63%). Leaders can expect greater demands from workers for speed in communications. Workers clearly favor tools that allow them to communicate quickly, with 80% saying they expect colleagues to answer emails as quickly as possible. Interestingly, frustrations with current tools like email — which was not designed for rapid (or for that matter mobile-friendly) communication — cut across all generational lines. Instead of revealing themes like Millennials only want to IM all day and Boomers are beholden to the email inbox, this data suggests solidarity — across generations — in dissatisfaction with many legacy communication tools. Workers also predict overall a future of work that is more digital (69%) and more global (60%). Slack users clock in happier with the level of information sharing and communication at work versus non-Slack users, which is perhaps why they report being happier at work overall. 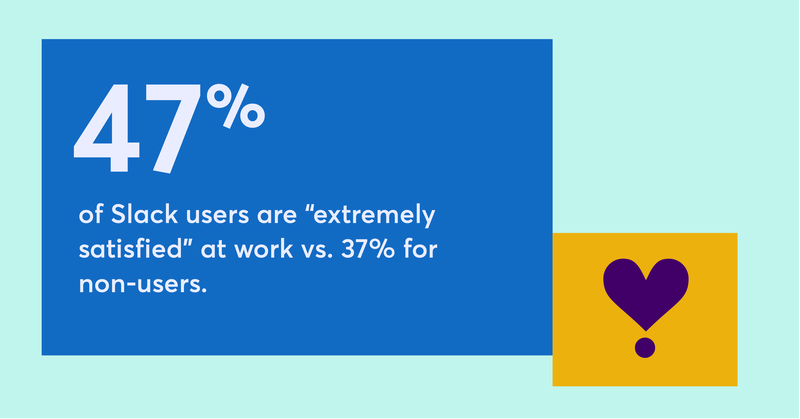 In all, Slack users are more likely than non-users to say they are extremely satisfied at work, 47% vs. 37%. One key reason for this might be the sheer number of uses for Slack at work. The survey included 12 different ways workers use Slack, from sending files to making decisions to integrating with other programs. Why care about app integrations? This is a major pain point for knowledge workers. A study by BetterCloud found workers at companies running on primarily cloud-based software, like many knowledge workers, interact with 34 different apps on average. Slack integrates with thousands of these independent applications, from Google Drive to JIRA, which eliminates most switching from browser to browser, login to login. That saves time and allows workers to concentrate on more important and complex tasks. Channels help improve collaboration and boost context by allowing individuals and teams to build a virtual workplace on Slack based on their unique needs. Channels can be created, prioritized and archived at any time, by team, project, location — whatever is needed — even shared securely with outside vendors. Workers of today are writing the next draft of organizational history and leaders would benefit from paying attention. It’s a healthy dialogue from where we sit. Where workers are demanding a seat at the decision-making table, they are also showing a willingness to invest more of their time pursuing innovative, creative work. They want flexibility but also deep bonds with co-workers. They demand modern tools but are willing to make the most of them. Even as competitive pressures continue to accelerate, the real battle may come down to an individual company and its future self. This data shows the version most likely to succeed will look more human, more interconnected, and certainly more collaborative. The Slack Future of Work Survey was conducted by Kelton Global among 1,459 knowledge workers ages 18 and over in the U.S. It included an oversample of 500 Slack users. Results of any sample are subject to sampling variation, which in this study is +/- 2.6 percent. For more information about this study, please reach out to pr@slack.com.